Product #15724 | SKU FP-4367Z | 0.0 (no ratings yet) Thanks for your rating! The Panel Frame Reflector Kit from Impact includes a reversible zebra patterned reflector panel, an aluminum alloy frame with crossbars, and a padded shoulder bag. It is designed to turn harsh direct sunlight into well-balanced fill light. 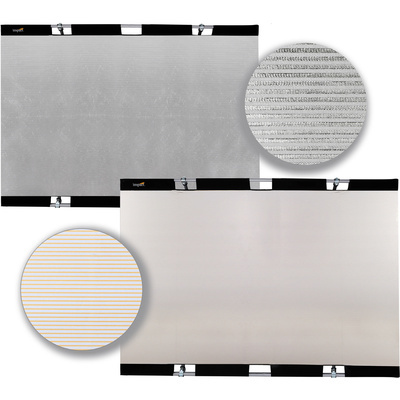 Both sides of the panel fabric have a zebra stripe pattern; one side is gold and silver, the other is silver and white. The silver side gives off a neutral colored specular light with moderate contrast, while the gold side produces a warmer color with slightly less contrast.